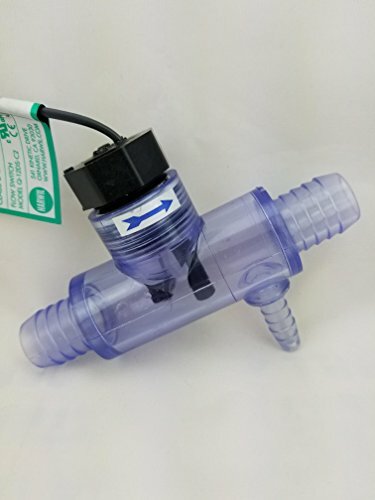 Generic YF-G1 Plastic Water Flow Hall Sensor Flowmeter / Counter - Black, G1"
Sundance Spas Flow Switch with transparent tee 3/4" barb and a 3/8" barb off the side. 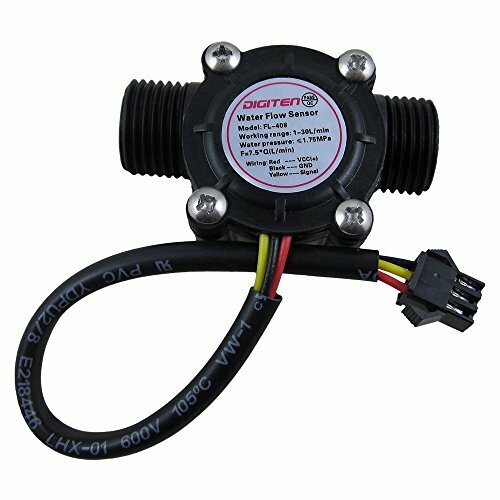 This flow switch fits all 1999-present 2 pump or 3 pump systems and 2001+ 1-Pump Capri Systems. Used on the following Spa Models: Sundance 800/850/880 Series, 1999 - Present Sweetwater and Portifino Series with Circulation Pump Jacuzzi J-300 LCD Series Models, 2002+ (with box end connectors). If you have a 2002+ LED J-300 use the 2560-040 (curled finger connector) Troubleshooting: A defective flow switch will cause a flashing 'Flo' or solid 'Flo' on the control panel icon. Solid 'Flo' is the flow switch Flashing 'Flo' could be the flow switch, circulation pump (clogged or defective) or dirty filter. Warranty: Returns are not accepted on opened or used products and are subject to a 20% restocking fee. 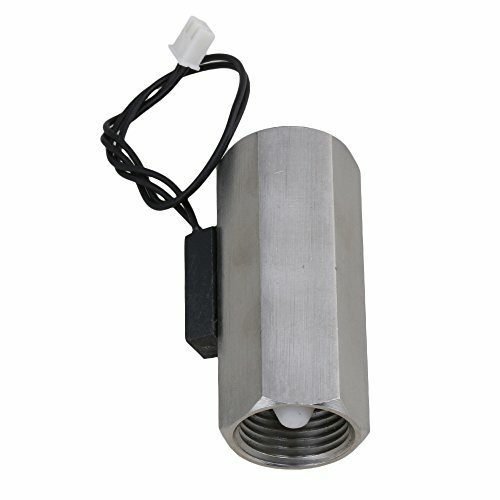 Flow Sensor for Eco smart Electric Tank less water heaters. Used with ECO 8 and ECO 11 models. Contact Eco smart for more information. 4. High temperature medium temperature: 70 ~ 120 ? 1. Automatic control, less water from the fill, the water from the stop. 2. A quarter of the inlet, a large amount of water. 3. The appearance of fine, small size, practical, simple installation. 4. No electricity, easy to use, long life, low failure rate, saving water resources. Flow Sensor for EcoSmart Electric Tankless water heaters. Used with ECO 8 and ECO 11 models. This is a replacement part. Frequency: F=4.8 * Q (L / Min) error:2% voltage :3.5-24VDC, current can not exceed 10mA, 450 output pulses/liters, F=onstant * units of flow (L / min) * time (seconds). 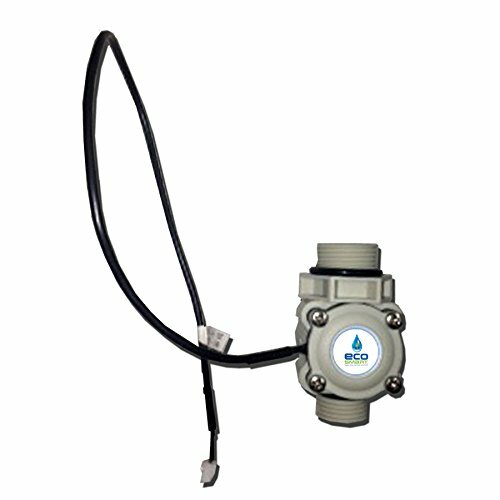 Suitable for water heater, POS terminal, automatic water dispenser etc. Made of high-quality copper material,environmental-friendly, really sturdy and durable to use. its maximum water pressure is 1.75MPa,the range of flow is from 2L/min to 45L/min. Three wire connection:Red for positive pole,black for negative pole, yellow for pulse signal. There is an integrated hall effect sensor that outputs an electrical pulse with every revolution. The hall effect sensor is sealed from the water pipe and allows the sensor to stay safe and dry. 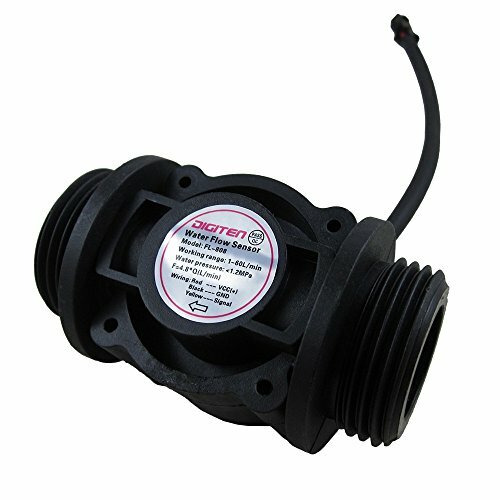 Lightweight,reasonable size,stable performance,low water pressure start,easy to install,safe to use. 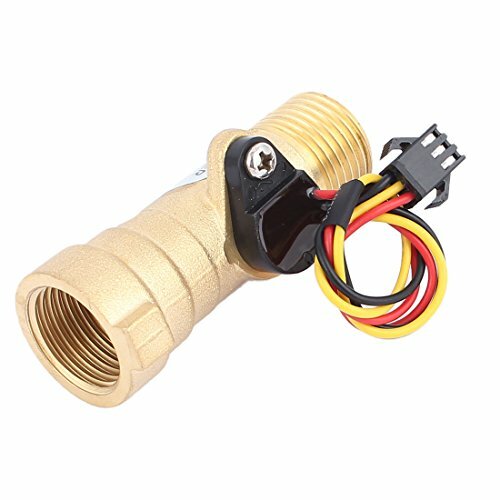 Made of high-quality copper material,environmental-friendly, really sturdy and durable to use;Lght weight, small size, easy to install;Stable,high temperature,low water pressure start,safe. 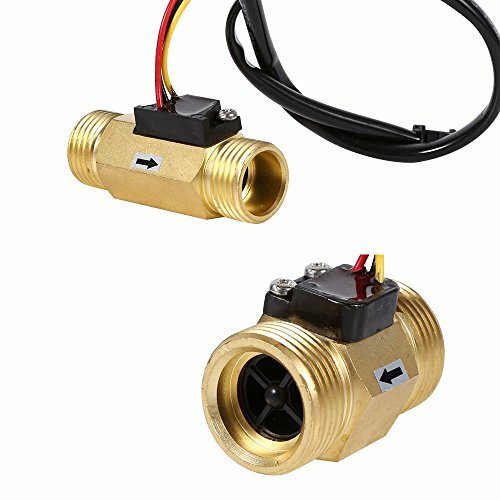 G3/4 Copper Liquid Water Flow Sensor Switch Flowmeter Meter;Can be perfectly used for water heaters,water dispenser, water purifier,water vending machine,coffee maker,flow measurement device,water control machine and so on. The LM35 Series are precision integrated-circuit temperature sensors, whose output voltage is linearly proportional to the Celsius (Centigrade) temperature. 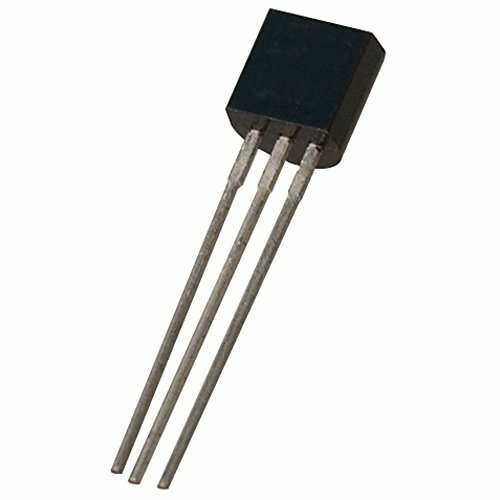 The LM35 thus has an advantage over linear temperature sensors calibrated in Kelvin, as the user is not required to subtract a large constant voltage from its output to obtain convenient Centigrade scaling. The LM35 does not require any external calibration or trimming to provide typical accuracies of +/-1/4 degree C at room temperature and +/- degree C over a full -55 to +150 degree C temperature range. Low cost is assured by trimming and calibration at the wafer level. The lm35's low output impedance, linear output, and precise inherent calibration make interfacing to readout or control circuitry especially easy. It can be used with single power supplies, or with Plus and minus supplies. As it draws only 60 UA from its supply, it has very low self-heating, less than 0.1 degree C in still air. The LM35 is rated to operate over a -55 degree to +150 degree C temperature range, while the lm35c is rated for a -40 degree to +110 degree C range (+/-10 degree with improved accuracy). Screw terminal connection, male thread, plastic coated housing, paddle type. Can be mounted with a horizontal pipe line or vertical pipeline for the air conditioner. Used in liquid flow lines carrying water or any fluid, not harmful to brass or phosphor bronze and not classified as a hazardous fluid . P100 Powder Cloud Air Flow Detection System. Viewable "smoke" for testing air currents and movement. 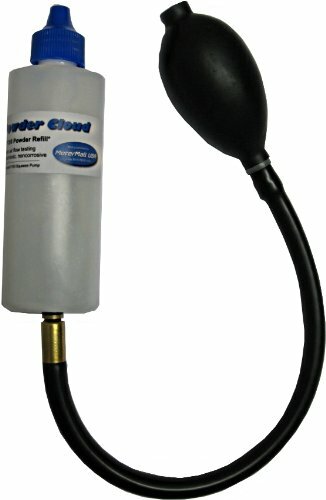 The P100 Powder Cloud System creates viewable clouds of highly micronized Borozin powder for studying low-velocity airflow. A high-quality rubber squeeze bulb gives a burst of air through the bottom of the P200 Powder Bottle. Quickly squeeze the bulb one or more times to create a cloud of appropriate size and density to conduct your airflow studies. 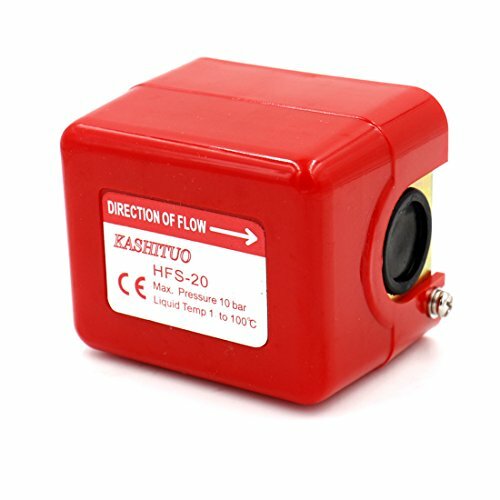 Perfect for determining wind direction or directional flow and velocity of air from HVAC systems, clean rooms, hospital isolation rooms and more. Powder Cloud will NOT set off smoke detectors or alarms. Our proprietary formulation of highly micronized, white Borozin Powder (Zinc Stearate) carries on air just like smoke. It offers high visibility, great hang time and virtually no residue. Eco-friendly, non-toxic, odorless, noncorrosive. The P100 Powder Cloud System comes with carry case, instruction, one squeeze bulb and one powder bottle that will provide hundreds of puffs of dense white clouds for your air flow tests. P200 Replacement powder bottles are sold separately. 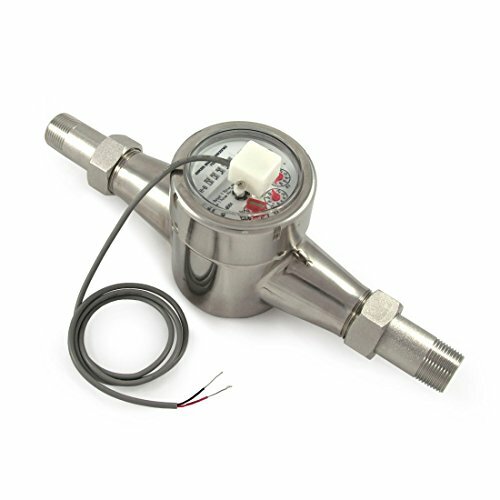 Our remote readable 3/4" Stainless Steel Pulse Output Water Meters are a great solution for remotely, or locally, monitoring water consumption. This is a well made, industrial grade, stainless steel (201 grade) water meter. You can use it as a traditional water meter where you read the water consumption off of the face of the meter. It also has the added functionality of being able to connect the pulse output wires to a pulse counting device. This meter produces a pulse for every 1/10 cubic foot (approx 0.75 gallon, or 2.83 liters) that flows by the meter, these pulses can be then picked up and counted by our pulse counting devices. Use these water submeters to meter the water consumption in your apartments, your irrigation water (which can save you in sewer costs in some areas), meter your well output, or use them to detect leaks while you are away. ACCURATE - A great solution for remotely or locally monitoring water consumption. 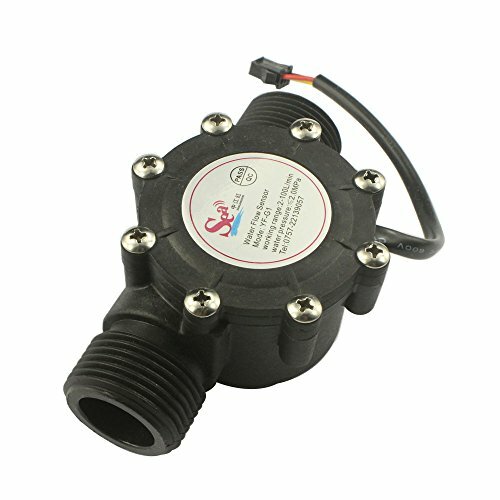 EASY TO USE - Simple 2-wire connection between water meter and kWh meter. No additional power source required. ADJUSTABLE - Read the face of the meter or connect to a pulse counting device. DURABLE - Stainless steel body and fittings. REVENUE GRADE - Meter readings can be used for billing purposes. Descriptions: 1. 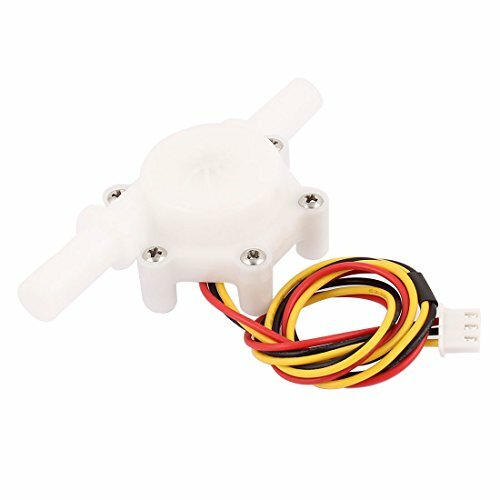 The water flow sensor is light, nimble outline, small size and easy to install. The bearings used in the rotating part. All materials are in line with RoHS testing standards. 2. There is an integrated magnetic Hall effect sensor that outputs an electrical pulse with every revolution. The Hall effect sensor is sealed from the water pipe and allows the sensor to stay safe and dry. 3. Three wire connection: red for positive, black for negative, yellow for pulse signal. 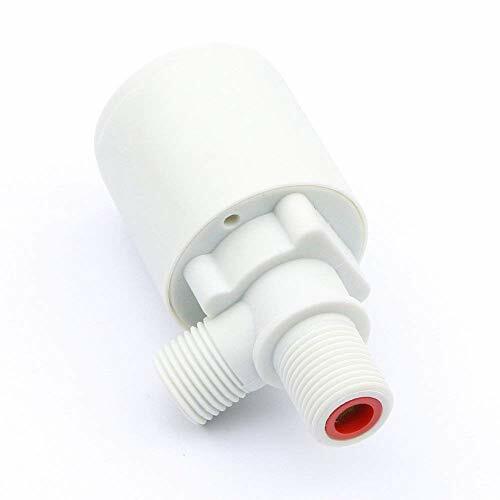 Specifications: product name: water flow sensor material: plastic(shell) liquid temperature: not more than 60C working voltage range: DC 4.5V~18v rated voltage: DC 5V max current: 15ma(dc 5V) maximum water pressure: 0.8Mpa flow range: 0.3-10L/min connector: male xh-3p plug cable Length: 33 cm size: 94mm x 43mm x 25mm(l*w*h) external diameter of connector: 9.8Mm(g3/8 inch) color: white net weight: 38G package included: 1 x water flow sensor. Descriptions: 1. 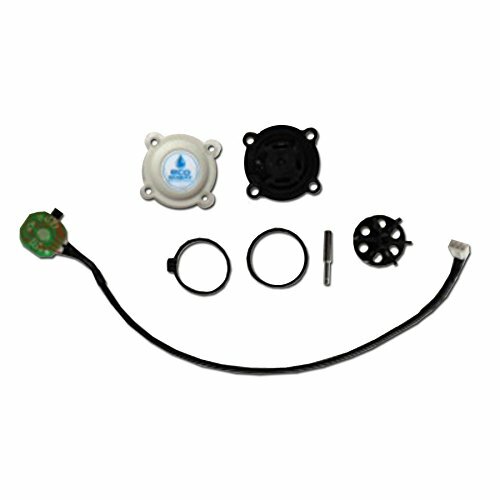 The water flow sensor is light, nimble outline, small size and easy to install. The bearings used in the rotating part. All materials are in line with RoHS testing standards. 2. There is an integrated magnetic Hall effect sensor that outputs an electrical pulse with every revolution. The Hall effect sensor is sealed from the water pipe and allows the sensor to stay safe and dry. 3. Three wire connection: red for positive, black for negative, yellow for pulse signal. 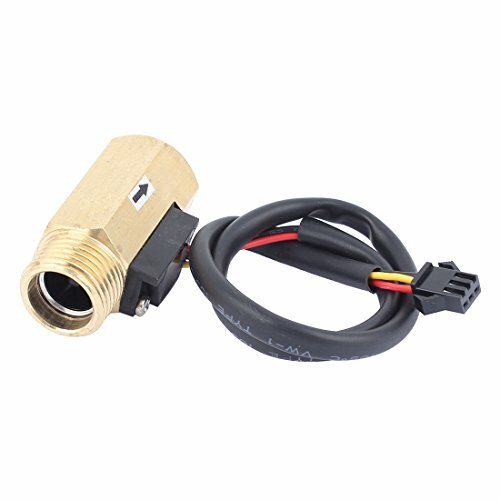 Specifications: product name: water flow sensor material: copper(shell) liquid temperature: not more than 60C working voltage range: DC 4.5V~18v rated voltage: DC 5V max current: 10ma(dc 5V) maximum water pressure: 1.75Mpa flow range: 1-30l/min connector: male sm-3p plug cable Length: 33 cm size: 50mm x 30mm x 28mm(l*w*h) external and internal thread diameter: G1/2 inch tube Length: 50mm color: gold Tone net weight: 103G package included: 1 x water flow sensor. All materials are in line with ROHS testing standards. Male SM-3P Plug Connection: Red for positive, black for negative, yellow for pulse signal. 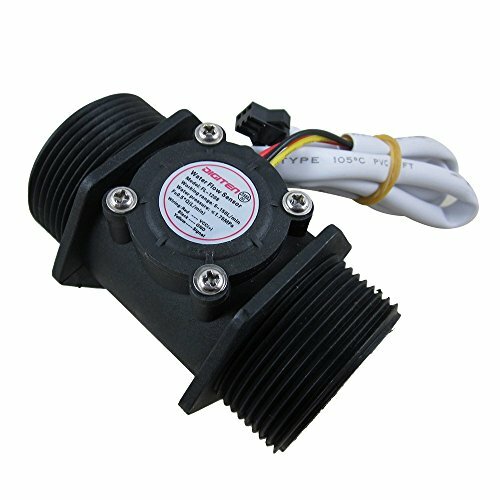 Maximum water pressure: 1.75MPa, flow range: 1-30L/min. Brass material, small size, easy to install. Descriptions: 1. 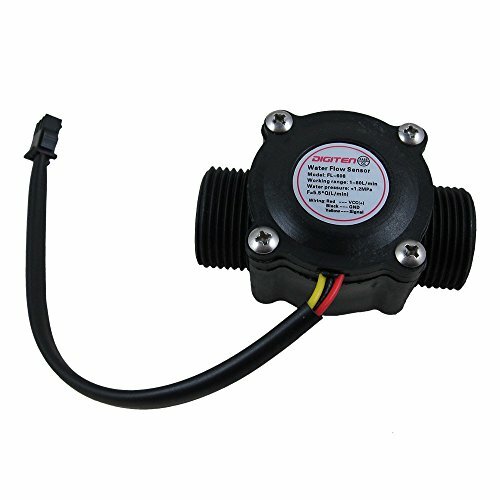 The water flow sensor is light, nimble outline, small size and easy to install. The bearings used in the rotating part. All materials are in line with RoHS testing standards. 2. There is an integrated magnetic Hall effect sensor that outputs an electrical pulse with every revolution. The Hall effect sensor is sealed from the water pipe and allows the sensor to stay safe and dry. 3. Three wire connection: red for positive, black for negative, yellow for pulse signal. 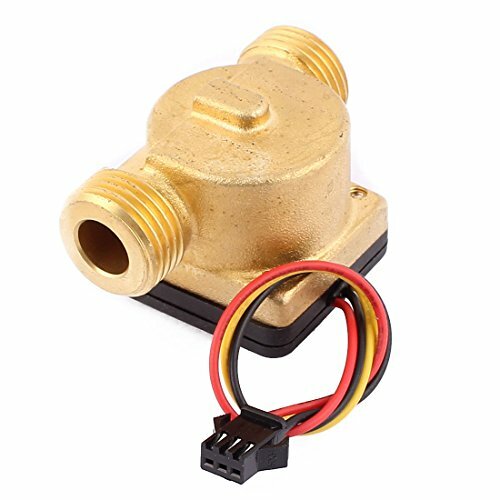 Specifications: product name: water flow sensor material: copper(shell) liquid temperature: not more than 60C working voltage range: DC 4.5V~18v rated voltage: DC 5V max current: 10ma(dc 5V) maximum water pressure: 1.75Mpa flow range: 1.25-30L/min connector: male sm-3p plug cable Length: 33 cm size: 67.3mm x 30mm x 27mm(l*w*h) external and internal thread diameter: G1/2 inch tube Length: 67.3mm color: gold Tone net weight: 94G package included: 1 x water flow sensor.